Most of our readers and especially those who have been with us since the beginning of our journey will know that it has long been our ultimate travel dream to take an Antarctica cruise. Finally, after more than two years of hard work travel blogging, that dream is coming true. 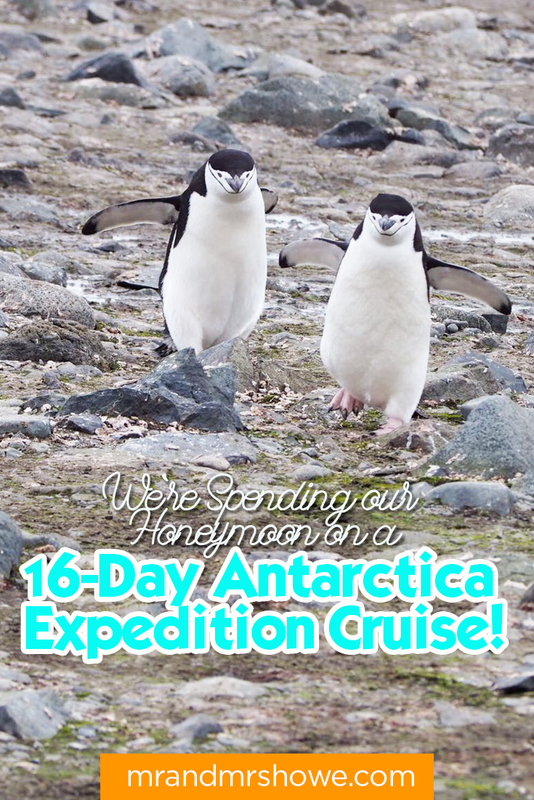 We are going to spend 16 days of our 365-day honeymoon in Antarctica! For our trip to Antarctica, we have been invited by Hurtigruten, one of the world leaders in Arctic and Antarctic Cruises, to join them on a 16-day expedition Antarctica cruise. On December 7th, Kach and I will be setting sail for an Antarctica cruise with Hurtigruten, which will take us on one of their Antarctic expedition ships, MS Midnatsol, from Punta Arenas in the majestic Chilean Patagonia, through the magnificent Chilean fjords, then 500 miles across the Drake Passage to the great white continent itself! Why are we so excited to join the Discover Patagonia and Antarctica Cruise with Hurtigruten? One is that it is one of the few remaining refuges of pristine and unspoiled nature on the planet. There is no another place like Antarctica in the world, with its great towers of ice protruding from dark crystal waters and the inhospitable beauty that only a select few have the qualities and skills to survive in, none of them human! It is also incredibly difficult to get to, which makes it all the more alluring! The exact same reasons that explorers over more than one hundred years have made it their life’s work to get there are the same reasons we are attracted there today. The wildlife that lives in Antarctica is something that both Kach and I have dreamt of seeing in real life, having grown up addicted to watching wildlife documentaries! While the variety of wildlife in Antarctica is limited to species that can survive the extreme conditions, we’ll likely see several different types of penguins, albatrosses, different types of seals, and even the chance to see whales breaching the surface for air. Finally, Antarctica is the 7th continent of the world, so this incredible opportunity to join the Discover Patagonia and Antarctica Cruise with Hurtigruten will be a massive step forward in Kach’s dream to set foot on all seven continents! What will we experience during the Antarctica Cruise with Hurtigruten? Of course, as with any sailing voyage, the weather and other conditions day to day will determine our final route and schedule, but here is the planned itinerary so far. 7th December - 15:00 - Setting Sail! We’ll be getting up extra early for our early morning charter flight from Santiago de Chile to Punta Arenas. As soon as we have checked in and been welcomed aboard by the expedition team, we’ll be instructed in the ship’s safety procedures, followed by lunch on board the ship and finally settling into our cabins from around 16:00. From the 7th to the 9th of December we’ll be sailing from Punta Arenas out through the Canal Gabriel, leading us into the Chilean fjords. The Chilean fjords offer some of the most incredible and breathtaking scenery on the planet. We saw a glimpse of the Chilean Fjords a couple of years ago as we travelled through Chilean Patagonia from Puerto Montt to Vila O’Higgins along the Carretera Austral, but what we did not get to see was the view of the southernmost Chilean fjords from the ocean, which we know is going to be spectacular. A true highlight of our Antarctica cruise at the very beginning of the voyage! On the way through the fjords, we’ll be sailing through the Garibaldi Fjord and passing the Garibaldi Glaciers! 10th December - Cape Horn and (hopefully) our first landing! Our first chance to make a landing in one of Hurtigruten’s specially designed and purposed inflatable Antarctic ribs will be the infamous and beautifully deadly Cape Horn, is conditions allow for it. We will spend the whole day at sea as we cross the Drake Passage, the 500-mile wide body of water between Cape Horn and the South Shetland Islands, which will mark our arrival at Antarctica! We won’t just be spending all day staring out at the open ocean though (although I quite happily could! ), as the MS Midnatsol will be showing movies all day, as well as scientific lectures on Antarctica and Antarctic Exploration. Of course, if we decide to take a break from all that awesomeness, there's always a Jacuzzi outside on the deck! 12th December to 17th December - Antarctic exploration, landings, adventure and wildlife! As soon as we arrive at the South Shetland Islands, the most exciting part of our Antarctica cruise will begin, with different landings planned for each day in Antarctica. The planned landings so far are; Half Moon Island; Deception Island; Neko Harbour; Almirante Brown; Cuvreville; Mikkelsen Harbour; and some alternatives depending on sea and weather conditions. We'll tell you more about all of these places in another article very soon! Having spent 12 incredible days at sea with our Hurtigruten Antarctica Cruise, we will begin the final leg of our voyage back to South America. After another full day at sea crossing the Drake Passage in the opposite direction, we will again pass Cape Horn, maybe landing there if it was not possible on the outward journey. On the way back to the Beagle Channel and the Chilean fjords we may have a chance to land at Puerto Williams, a small town facing the ocean with snow-capped mountains at its back. On the final full day of sailing on our Antarctica Cruise, we will sail once again through the enchanting Chilean fjords, stop somewhere on the way to land and admire the magnificent natural surroundings. This will also be where still full of the excitement and wonder of the experiences we have had; we will say goodbye to this beautiful landscape. The following morning we will dock early at Punta Arenas, say goodbye to our new friends and crew, then leave the MS Midnatsol ready for the next stage of our journey. How can you go on this 16 day Discover Patagonia and Antarctica Cruise? Our particular Antarctica Cruise is the 16 Day Discover Patagonia and Antarctica Cruise, with prices starting from $7041 USD (5192 €) per person. Don't forget to plan well ahead, as the seasons for Antarctica cruises only run from December to March. Jonathan and I are going to do FAN Signs (hopefully with penguins on the background!) to 30 lovely readers anywhere in the world! Tag any friends you would want to go to Antarctica with! Make the post public, so we can see it then comment below on what you want to know about Antarctica!